Undergraduate supply chain students presented real-world solutions to industry professionals during the annual Bauer Supply Chain Forum Case Competition. The winning team (from left) included Janely Toledo, Jordon Powell, Eric Clark, Victoria Martinez and Sundus Sheraz. 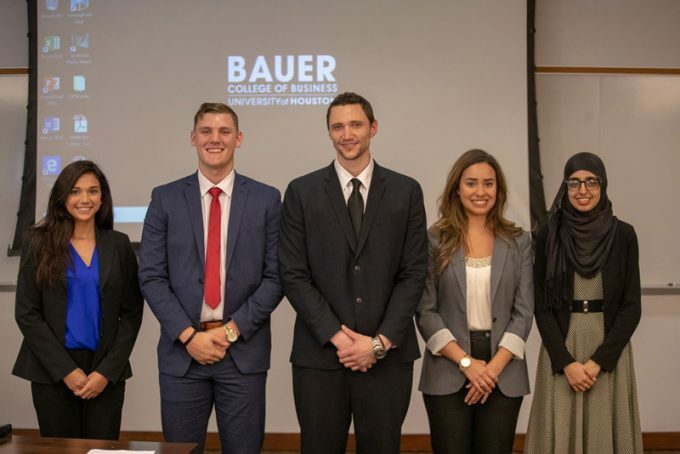 Undergraduate students from the C. T. Bauer College of Business put their skills to practice recently during the Bauer Supply Chain Forum Case Competition. Four teams of supply chain management students participated in the event, with Sundus Sheraz, Eric Clark, Janely Toledo, Victoria Martinez and Jordon Powell earning the final prize of $2,000. Besting 15 teams in a preliminary round, the students were presented with a supply chain problem by PortCo., a port management and startup company based in Basra, Iraq. Students had one week to prepare their solutions, with an additional week to make adjustments for the final round. The teams presented their solutions to a panel of judges from more than a dozen different companies that participated in the preliminary and finals judging rounds. “Competitions like these helps our students further develop their critical thinking, presentation and communication skills by solving real world problems, and presenting their solutions to corporate judges,” Decision & Information Sciences Clinical Assistant Professor Dale Tibodeau said. He added: “Employers, who serve as our competition judges, get to see our students perform and many of these employers use the competition as a way of recruiting our students into internships and full-time positions within their companies. The judges provided feedback and scores, and all participants learned the solution that was implemented by PortCo. First Place: Sundus Sheraz, Eric Clark, Janely Toledy, Victoria Martinez, Jordon Powell.